I had services at Mt. Olive on Tues. Oak Park on Wed. and St. Petri on Thurs. This was our "Ash Wednesday Service" with Communion. On the drive to Mt. Olive I saw about 30 deer next to the road. Oak Park is only 100 feet from the house so I didn't see any deer on my way to church that night. But on the way to St. Petri there were herds and herds of deer. I counted 82, but that was only because I had passed several herds before I could fully count them. I hope I don't get a deer out of season. That would mean some bodywork on my car. Bible Study for Lent this year is the Book of Genesis. This first week we covered a survey and outline of Genesis and close study on Creation. Next week we'll study the Fall into sin. Oscar's funeral is Monday at Nazareth, 11am. Please keep Mildred, Larry, Sandy and their family in your prayers. Eli M. was hospitalized today (Friday), son of Emily and Issac M. He's not quite a year old and may have RSV or the flu. I stopped by at the hospital. He seemed to be responding well to treatment. Please keep him and his family in your prayers. Aric B. is going to Mayo for a workup on his heart problem. Aric is 28 years old and had a heart attack. We are grateful he survived. Aric just married his wife Erica this past summer. Please pray for him and his family during this time of trouble. We just buried his older brother, Ryan, this past Monday. His family has been through some great stress. There's more. There's always more. I can't write about all the issues and concerns we have here. That's part of what it means to have living and breathing congregations in the Christian Church. But please keep us in mind. Yesterday morning Renae M. called me fairly early. Oscar Nerhus passed away. I went over to see Mildred, Larry and Sandy. John, Sophie, and Matthew came with me. We spent quite a bit of time with Mildred. Larry and Sandy had to go out to tend the herd. Their cows are calving. It's supposed to get to -20 in the evening. From there we went to Henry B's to drop off some soup. Henry was worried about Lonny. So we stopped to check on Lonny. He's got bad bronchitis. I told him to call his dad. After that we went down to Gonvick. Now, I need to tell you that the roads were all bad. When a snow plow went by on the Gully road, there was no visibility. So I pulled over to the side of the road and stopped. After it cleared I pulled out. Then speeding out of the snow cloud from behind came a mini-van without headlights. He slowed down just before getting to us. But, man, I mean. What kind of an idiot takes his family through a no visibility cloud of snow at almost 60mph? Then on 92 some lady was half-way over in our lane as she came over a hill toward us. Does bad weather make people think and do stupid things? Or do they do all these stupid things all the time and the bad weather makes them more obvious? I fed the kids at Paula's (the restaurant in Gonvick). They have lots of breaded deep fried things, and sandwiches. I went without. But they enjoyed their rare treat of real wheat. Then to Forest's place to check on him and Donna. They seem to be doing pretty well. Mike N. stopped by while we were there. And a neighbor and his son stopped by with the finished bear skin rug from the boy's fall kill. The black bear was 600 and more pounds: second after the state record. It was huge. After checking on Forest and Donna we went to Muriel's to check on her. She only has pain at her incision site. He knee replacement was a partial. So they have her up and walking as much as possible now. She's doing well. I'll check on Mildred, and Cheryl and Rod today. No word yet on when Oscar's funeral will be. Please keep our parish in your prayers. At Ryan's wake, Rick B. told me that he was devastated by the hole that Ryan's death left. I told him I would address that problem in our devotion during the visitation. This is what I taught. "Ricky, the hole that Ryan's death must remain a hole in our lives. Nothing can fill it. Nothing should ever fill it in this life. There is no substitute for Ryan; not for you, for me, for his children or for anyone else that knew and loved him. "The hole in our lives can only be filled by what Christ has done for Ryan by giving him faith in Christ. Ryan will rise from the dead at the last day. And the hole in our lives won't be enough to fill what Christ has done with Ryan. Our cup will overflow. "Now we see but a poor reflection as in a mirror; then we shall see face to face. Now we know in part; then we shall know fully, even as we are fully known." I Cor. 13:12 (paraphrased). "No one can replace him. And no one has to. "Yes he had faults. He was a sinner, born in sin and committing sins against God and his neighbor in this life. And though we remember his best attributes at this time, the fact is that Christ brought him to be baptized. Christ brought him to worship to receive the Lord's Supper. Christ brought Ryan to repentance, confession, and the forgiveness of sins. "Christ will fill that hole in our lives with Ryan himself, only Ryan will be remade perfect in the image of God. As will we all through faith in Christ alone. And we will be able at that time to love God and each other perfectly. "So none of us should try to fill the hole left by a loved one's death. Let Christ fill that hole while we walk in this vale of tears. Let the certainty of the resurrection in Christ comfort us in the meanwhile. For God has revealed that Christ has lived and died for us and our loved ones who have gone before. "Our desire and prayer now is that God grant us His Holy Spirit to keep us in this same faith in Jesus Christ, crucified for us, risen for us. So that when Christ comes again He will receive us in the heavenly mansions." The funeral for Ryan today was very difficult for me-with all the parallels to my own brother's death. And God granted His grace that I could teach clearly, and even sing clearly during Ryan's funeral. Please keep Ryan's family as well as Betty M.'s family in your prayers. Where does Spiritual Growth take place? Real Christian spiritual growth takes place through the Means of Grace: the Word and the Sacraments. And God has chosen to use suffering in this world as a way to deprive us of our worldly resources and idols so that we flee to the Means of Grace. Difficult times like we are facing in our parish right now: watching loved ones die and go to heaven, are some of the most intense kinds of suffering we who survive can face. We are being refined like impure ore. The questions facing us at the real spiritual level concern whether we will recognize our absolute guilt and worthlessness before God's Law and God's verdict of our Justification by faith in His Son, Jesus Christ. Our loved ones can become our idols. We forget that God owns us and them. We do not. God owes us nothing. Because of our sin we owe our temporal and eternal punishment. But God does not wish to give that to us. Rather, His Son volunteered to live under His Law perfectly and to take the punishment that all of us deserved so we can have a perfect record before God's justice. Ryan died young (34 years old) just like my own brother 5 years ago. His parents are going through a tragic loss, just like my own parents went through--AND STILL GO THROUGH (sorry, Mom and Dad, I need to write this to help my own flock. I know you will understand). His siblings are experiencing exactly what I went through--and still go through to this day. Ryan's children are experiencing exactly what my wife went through when she lost her dad to a heart attack when she was a child. She lost her mother to cancer a year later. Our flesh is torn. It hurts deeply. But my brother, Jeremy, along with Ryan, belong to God first. They do not belong to us. We are privileged to enjoy our love, life, and experience together for a while in this world. Forest lost his best friend and sweetheart of almost 46 years. He is going through the loss of his wife and the love of his life in this world. My point is that we all go through these extremely difficult trials. When we face them we feel all alone. And we are in danger of thinking that no one could relate or understand what we are going through. We are in danger of making our own grief over our loss into an idol and holding the loss we have experienced against God. We reason in our own grief: "If God is so loving, why could he have allowed such a tragedy to happen to me and my loved one?" And we forget what we really deserve: what our loved one really deserved. In our grief we may even loose sight of what Jesus Christ suffered so that death is not the end, but a sleep from which God will raise us at the last day through faith in Jesus Christ. In our grief we can forget that there is a resurrection because the Son of God suffered so greatly in our place. Others around you in your time of loss have experienced what you have, are, or will experience. And Christ has suffered worse so that our loss is not permanent. We will rise through faith in Christ. And we will see our loved ones who have died in this same faith again. And even more, we will be with God in eternity: Loving God perfectly, and loving each other perfectly. God will grant that we all will experience so great a loss so that we can appreciate the depth and richness of what Christ has given for us with his conception, birth, life, sufferings, horrific trial-punishment-and execution, and with His resurrection. The sin that we have inherited and that we do in thought, word and deed means that we all will die. Some of us horribly, some of us peacefully after a long life. But die we will. The gift of Christ's life and death for us means that the death of our loved ones and our own death is not to be feared or abhorred. Rather, because of Christ's life, death, and resurrection eternal life we can be certain-have the true faith-that we all will rise again at the last day and see our loved ones in Christ and know and love them and God Himself more intensely and purely than we could ever imagine love could be here in this valley of sorrows. Spiritual growth isn't given in seminars or weekend retreats. Real growth in faith comes through the Means of Grace and the school of tribulation. It comes under the Cross which Christ told us we would need to bear. Real growth comes through having our props and idols destroyed and our retreat to the Means of Grace where God Himself told us He would nourish and feed us. Real growth comes from trusting God's written word; the word spoken to us at our Baptisms; the word spoken to us in the Absolution; and the word spoken to us in the Lord's Supper: "Given and shed for you for the remission of sins." Our loved ones who have died in faith in Christ enjoy paradise. At the last day "the dead in Christ will rise first. Then we who are alive and remain will be caught up with them in the clouds to meet Christ." Comfort one another with these words. I'm sorry. I've had too much on my plate to post on this blog recently. Our family has been going through the ordeal of the flu. But before that we had Elsie's birthday. I'll try to get a post on her birthday up sometime soon. A week ago on Friday I had a deathbed call for Betty M. Her husband, Forest, and her sister, Donna, were there. Matt came with me to the GF hospital to help me keep awake on the drive. Betty died when Forest, Donna and I were in the room. Her funeral is this morning, Friday, at Nazareth. Isaac P. went through surgery today. I visited him in the Hospital yesterday. A member at Nazareth lost her father this past week and I need to visit her. This morning Ryan B. (34 years old) was killed in a car accident. He has two children. I spent the morning with Ryan's family. In the afternoon I worked on my sermons for Betty's wake and funeral. In the evening I held services for Betty's wake at the Fosston funeral home. Please keep our members in your prayers. Betty's, Ryan's and the other's families in this time of loss. I have a lot of visits to make tomorrow after the funeral and planning for Ryan's funeral. So if you, members of my congregation need to contact me, leave a message with Mary. Please read this bill and make sure your representatives hear from you. '(B) pursuant to a State firearm licensing and record of sale system certified under section 602 of Blair Holt's Firearm Licensing and Record of Sale Act of 2009, which license has not been invalidated or revoked under State law. '(B) with respect to a qualifying firearm that is acquired by the person on or after the date of the enactment of Blair Holt's Firearm Licensing and Record of Sale Act of 2009, 1 year after such date of enactment.'. Already we need to apply for permits to purchase and permits to carry. This right has eroded so significantly that people who want the Constitution to be treated as the actual law of our nation are considered kooks. Learn your history. Free societies have the ability for each citizen to defend himself or herself. Many members have expressed concern over the workload that their Pastor faces during the year. I thank you all for your concern and for your understanding when I need to take a break. I want you to understand and share my priorities. God has called each of us to our own vocations. In my position I rank my priorities this way: my Faith, my family, my duties in my call as Pastor, and then my personal desires. You all know that our parish consists of 4 congregations. That means that any regularly attending member of our congregations can at best only witness only a quarter of what your Pastor does. And only if you are with me all the time and each congregation was equal in its needs. But none of you can be with me all the time, and our congregations differ greatly in size and needs. My priority as Pastor is the regular worship service where all members who are able can gather to benefit from the Means of Grace. Next are those who are in special needs; whether life threatening or those sorely oppressed by sin and the conflicts of sin. This includes hospital calls, deathbed calls, marriage problems, and personal problems. I can only respond to those in special need if they make their need known to me. After special needs come the Shut-ins. Some of the shut-ins are truly unable to attend regular worship. When visiting shut-ins I have to consider several things. First, if my family has sickness that can be passed to a shut-in, I will not go to the shut-in. Second, if there is someone in special need when I have planned a shut-in visit, I will go to the person or family with the special need. Third, the weather frustrates me often when visiting shut-ins. And lastly, some of the shut-ins aren't home when I try to visit. There are several shut-ins who can attend regular worship, and some who do from time to time. Those who do attend from time to time are not in as great a need as those who cannot. Those who can attend but choose not to are not in as great of need as those who cannot. Ideally I would try to visit each shut-in each month. But this rarely happens. At best I can expect to visit a shut-in 3 or 4 times a year. There are a few shut-ins that I have been able to visit each month. There are more shut-ins that I have only visited a handful of times during the year. When my family has a cold or the flu I cannot take that sickness to the shut-ins. Weather also plays a big role during the winter months. And, all too frequently, a shut-in is not home or has scheduling conflict that prevents our meeting. Add to this the need of those who are facing critical spiritual issues. Those cannot be scheduled. And they force your Pastor to choose one over the other. My priority is the hospital call, the deathbed call, and marriage problems before going to the shut-in. In taking care of the shut-ins I ask for each congregation to help take up the slack where I am not able. After the shut-ins my next priority is Bible Study for the congregations. This past year we had 9 sessions of Bible Study for every member of each congregation. With each session being about 2 to 3 hours on average. [9 times 2 is 18, times 4 congregations is 72 hours, if they went 3 hours each it would be 108 hours total] The Lenten Bible study series covered the Biblical basis and reasons for why we worship in the way we do. The Summer Bible Study covered our practice of Closed Communion. That's not as much as I hoped to cover in a year, but it is as much as I am able to do. Writing Bible Studies takes considerable time. I am regretful that not everyone was able to afford the time from their schedules to attend them. None the less, your Pastor is grateful for those who did attend and benefited from the Bible Studies. Next comes Confirmation and Wednesday School. We want our children to be able to examine themselves before receiving the Lord's Supper. Originally this is the parents' duty to teach and the Pastor's duty to examine. In our times it has fallen upon the Pastor and volunteers to teach. This past year Dawn N. and Tami S. have taught the lower level classes (grades 3-5). Our Parish owes them a great debt of gratitude. Confirmation classes require the assent and insistence of the parents to ensure that their children are studying and learning the assigned lessons. After this comes Saturday/Sunday School. I arrange and manage the general flow of the lessons at three of our congregations. I am the only teacher at one of our congregations. One of our congregations uses material produced by Concordia Publishing House. This is all a bit awkward to manage and involves quite a bit of work and time. But it works. Each of our congregations should acknowledge and thank the teachers in their own Sunday Schools. Your Pastor has meetings with the teachers to lay out the plan and help resolve any scheduling and personal difficulties that go along with managing and teaching the Sunday Schools. And I am very grateful to the volunteers for all the work that they do. Youth Group is my next priority. Youth Group comes this late because most of the Youth Group members are full members of their congregation. They are responsible for attending worship and admitting themselves to the Lord's Supper. The Youth Groups meet in the school-year months and sometimes in the summer. They have the Presidents' Day retreat (a 2 day event attended by Pastor), the National Youth Retreat (Pastor does not attend), Camp Indianhead (Pastor does not attend), and our fall Clearwater Lutheran Parish Shootout (an all day event the Pastor coordinates, arranges and participates in) as regular events. In addition to this they enjoy bowling, skiing, and a car-wash each year. I am hoping to add some service oriented activities to the Youth Groups schedule. Outreach and Evangelism come next in my lit of priorities. I am working with a handful of families on witnessing to them, teaching them, and encouraging them toward attending our churches. Some of these are children or parents of members. Others have no relatives in our congregations. I deeply appreciate the work that some of our members are doing in this direction and work hard to follow up with visits to those people you want me to meet. Outreach and Evangelism are the duties of all members of the congregations as far as their own God given vocation allows. The pressure to get more members is a strong temptation. And it is a temptation. The real issue is presenting the true Word of God to our neighbor. We are not in the business of filling pews for the sake of the congregations. We are called by God to bring the Gospel to the perishing. Visiting Members is next on my priority list. I have tried over the years to stop at each member's home to visit them. Pastor P. served here in the 1950s as his first call. He had relatives in my home congregation of Rock Dell Ev. Luth. Church. I've known him all my life. And he was my teacher at Seminary. He said, “A home visiting pastor has a church going congregation.” This is true up to a point. A pastor should make every possible effort to know what his sheep are dealing with in their own lives. This makes him able to address the needs of his sheep. But we are spread over many hundreds of square miles in this parish. So my work at this is slow. Pastor P.'s saying can be taken in a wrong way. The wrong way to understand him is to think that because the Pastor has not visited someone's home, therefore he does not care for those members. If you want me to come, let me know. Even then, it might take some time for me to arrange a visit. There are so many things going on. Please be patient with me and forgiving. Your Pastor is also only just another weak sinful man. Your Pastor cannot attend all these meetings. 4 meetings for each Voters assembly each year also is 16 meetings. And add to that 4 quarterly meetings of the Parish Board: for a total of 20. Two congregations have regular Ladies' Aid meetings for 9 months of the year. The other two hold meetings as needed. This means another 18 plus meetings and the time it takes to go to them and get home. That is 36 and more additional meetings where your Pastor could be presenting Bible Studies or devotions. Your Pastor really would like to be able to be present at all of these meetings. But he can't. I want to be at each of these meetings. In reality, your Pastor can only really attend the Parish Board meetings and try to get to others as he is able. Social Club and other events that a congregation may hold; for example: baby showers, wedding showers, themed parties, auctions, or dinners have to come after all these other priorities. I rarely attend these events. Occasionally I will get to a bake sale or auction. In 7 years I still haven't been to the Mt. Olive sale at the Gonvick Rodeo, though I would like to. I try to contribute to these events as I am able. For example: if there is a bake sale-and I have the time-I might make something to be sold at the sale. But it is not often that I can. The articles are part of your Pastor's commission to reach out to our neighbors with the clear Word of God, and through that Word to bring them to the knowledge of the truth in Jesus Christ. This is a direct outreach and evangelism effort by your Pastor. My prayer is that those affected by the articles can be reached by members in the area for fuller and better instruction. There were 205 scheduled Worship Services held at the congregations during the year. Pastor led 198 of them, Deacons held 10, Pr. Stafford led 1. Pastor held 11 Funeral services (visitations and funerals added together), over 65 urgent hospital or health related devotions, over 150 shut-in devotions. There were 5 couples that participated in pre-marital counseling involving at least 12 hours per couple—two of these were married last year, three couples are planning on weddings this year (2009). I have held personal meetings and devotions with several individuals who were either considering membership at one of our congregations or were in need of special spiritual counseling. 45 led by pastor, 1 by Pr. S.
Oak Park 48 of 52 services were held 4 weather related cancellations. Nazareth 47 of 52 services were held 5 weather related cancellations. St. Petri 48 of 52 services were held 4 weather related cancellations. Pastor preached and led 178 regular weekend services during the year. Mt Olive 5 of the 6 Lenten services were held, 1 weather related cancellation. St. Petri 6 Lenten services were held. 6 Lenten services were held. These extra services involved 4 specially written sermons outside the regular weekend worship cycle. Jan 20 Nazareth and Oak Park, St. Petri had services. Feb 10 St. Petri, Nazareth, Oak Park; no services at all this weekend. April 27 Nazareth, St. Petri and Oak Park had services. Dec 21 Nazareth, Mt. Olive, St. Petri, and Oak Park held Christmas Programs. The funerals required the writing of 11 different sermons. Tina, Rose, and Patty had only one service. Leonard was taken care of by Pr. Timothy L. Bert, Hilda, Lyle, and Nancy had both visitation services and funeral services. A member at Ebro Corner, Bagley, for Pastor S.
Pastor had at least these 40 urgent or emergency hospital visits. Besides this there were more than 25 home visits for members facing health issues. Becky R. and Nathan S., 7/19 at Jim R.'s home, Oak Park. Aric B. and Erica H. 9/6 at Nazareth. Planning and coordinating an annual schedule for 4 congregations is a difficult task. I want each congregation to thank those from the Ladies' Aids, the Sunday School teachers and helpers, the Voters Assemblies, and the Parish Board for all the hard work they do in bringing together all the information needed for planning and scheduling. There are often some mistakes that I make in scheduling. Sometimes it has to do with new events that a congregation might want to host. Other times it just has to do with my own forgetfulness when I publish the calendar for each month. Please be patient with your Pastor and help him when the schedule gets confused. I still have to look at the calendar each Sunday to be sure where I'm supposed to go at what time. Sermons can take as few as 5 hours or as many as 30 hours in a week to write. I would guess that my average is about 10 hours per sermon or bit less. As mentioned above we had two main Bible Study topics this past year: Our Worship Service, and Our Communion Practice. These were available to all our parishioners in 9 separate sessions at each congregation this past year. Writing the studies takes a considerable amount of time: at least 40 hours per Bible Study, or about 3 ½ hours per session. If you can attend, please do. These were held Jan, Feb, Mar, Apr, May, Sept. Oct. Nov. Dec. The “Winkels” are the study groups of our Synod's pastors in our Circuit. We get together regularly for several reasons. The reasons are these: 1) to build each other up through the study of God's Word together as Pastors. 2) to keep track of Synodical and Circuit business and planning: such as the President's Day Youth Retreat, or the Circuit Lay meeting; 3) to share with each other problems and situations that we face in our own parishes for Spiritual counsel and advice. Pastor presented at all but one of these meetings. The presentations were either oral or written papers. There are two annual fun events in which the pastors of our Circuit and their families take part. We have a Summer picnic in Itasca State Park during the Summer. And we have a Christmas dinner in December or January. Each Spring our Circuit holds a meeting for all the membership of our congregations. This past Spring the meeting was at Immanuel in Audubon, MN. on June 1st. Dr. David Menton of the Creation Research Institute presented on the topics of the Bible, Evolution, and Creationism. In past years your Pastor has presented papers on “The Three Estates” (at Our Savior's Ebro Corner), “Closed Communion” (at Immanuel in Audubon), and “A Comparison Between the PMW and the Circuit 8 Revision” (at River Heights in East Grand Forks). Your Pastor has Celiac Disease. Because of this health issue he is not able to attend events that require him to be present for more than two days. For some two day events your Pastor brings his own food or fasts. But events that require extensive travel and long stays are no longer possible for him due to this health concern. There are two events that I would normally have taken part in: The Synod Convention, and the General Pastoral Conference of the ELS. There are three other events that I would have liked to take part in to further my education and study but could not because of Celiac Disease. Please thank the members who were willing to go to the Synod Convention. Keep the Synod, its President, Pastors, Congregations and membership in your prayers. As mentioned above, your Pastor teaches Confirmation Class to students at Wednesday School, to adults desiring to enter our congregations, and to some individuals with special needs. Wednesday School is held for 36 Wednesdays of the year at Oak Park during the regular school year. Individual instruction for adults and special needs students is held throughout the year whenever possible. Wednesday School starts at 3rd Grade. This past year Dawn Neuschwaner has taught grades 3-5. I have taught grades 6-8. The goal is that grades 3-5 will know Luther's Small Catechism by heart before they enter Confirmation Class with the Pastor. Your Pastor written a three year curriculum in place for grades 3-5 and a separate curriculum for grades 6-8. The main goal is that each of our children is able to know the basic teaching of God's Word so that they can examine themselves properly before going to receive Christs Body and Blood in the Sacrament of the Altar. As a teacher your Pastor is doing the duty of the parents who are to “Train up a child in the way he should go,And when he is old he will not depart from it. (Prov. 22:6). As a teacher your Pastor needs your support in eliciting discipline from your children so that they memorize, learn, recite, and can discuss the subjects presented to them in class. As Pastor I am required to evaluate whether or not I think that these children are able to properly examine themselves before taking part in the Lord's Supper. The better your children have memorized the material we assign, the better they will be able to talk about it's real meaning. And when it comes to evaluating their ability to examine themselves, if they know the Catechism and the Bible's teaching, the better off they will be. The main purpose of the Youth Group—called LYS for Lutheran Youth Society—is to provide regular Biblical and devotional study for our youth from the age of Confirmation class through the end of High school. The goal is to help them grow in Christ so that they become responsible members of each congregation by knowing God's Word and how the world works. They need to generate the income to do the activities in which they want to take part. The Pastor's aim is to have them realize that supporting a living congregation with Word and Sacrament has now become their responsibility both Spiritually and with the secular gifts that God has given them. Our Parish Youth Group is very active. Clearwater Parish LYS hosts its annual Shootout which is very well attended by other area youth from our Circuit and elsewhere. We have an All Saints' 'Eve party (Halloween) in where your Pastor teaches on different parts of the Reformation. This past year we studied Papal Indulgences, what they were, what they are, and why Martin Luther wrote the 95 Theses—which are considered the start of the Reformation. Our Circuit has an annual President's Day Retreat. Your Pastor has presented a devotional Bible Study at the retreat last year and in years past. He also leads the morning exercise period. The Oak Park and St. Petri LYS and their families host Lenten suppers. There was a ski trip in the winter of 2008 and a day of bowling in the Spring. Meetings with the whole Parish youth are held almost every month of the school year with devotions led by Pastor. The youth have summer camp, Camp Indian Head, organized by Pr. Thompson in Audubon, and held at Luther Island Camp south of Perham. And they have the Summer ELS LYA convention available to them. They washed cars to earn some money for these trips. The Lenten suppers helped to provide funds. And the various congregations have helped out through the Ladies' Aids and other organizations. Your Pastor has a lot of different hobbies that he does with great enjoyment. But he tries to keep current on the Biblical Languages by regularly reading the Bible in Hebrew, Greek, Syriac, and Aramaic. He has been working intently on an issue with they Synodical President along with the rest of the Circuit 8 pastors. He has been learning and reading the Norwegian Synod founder's works along with Luther's, the Reformers', and the Confessors' works in Latin, in Riksmal/Bokmal Norwegian, and in German. Your Pastor has also been working on several other projects that may see fruition in the near future. Besides writing the curriculums for Wed. School and Sunday School, planning the hymns and regular worship services; he has been working on three topics that have reached book length. The first is a Biblical and Historical study on the issue of Women in the Church. The second is a comprehensive evaluation of the regular worship services in use in the ELS, WELS, LCMS and other Synods that refer to themselves as Confessional. The third is a resource for Lutheran worship, a study and application of the Historic Lessons and their use in the Divine Service. After giving the report to my congregations several members mentioned that I had not included my visits to them in the report, nor several projects that I did for specific members; whether food and necessity related or something like making a dog-house. The point is that the report I gave is under reporting what was done this past year. Hackers with a sense of humor. 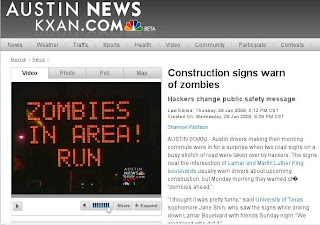 The KXAN article.